“The consensus this year is that the black grapes were not easy,” began Frédéric Panaïotis. We met with Champagne Ruinart’s long-standing Chef de Cave during the busy blending period in March to taste a sample of the still wines and hear how Ruinart fared during the 2017 vintage. Noting the distinct lack of terrible years since the millenium – “only ’01 was really bad in the 2000s… ’11 will be a challenge but ’14 and ’16 are very manageable” – Panaïotis seemed unperturbed by the difficulties of the growing season just gone, perhaps a consequence of the house he represents. “Reserve wines are part of the game this year, so it’s good when you have a lot,” he smiled. To demonstrate his confidence, Panaïotis shared with us some Pinot Noirs and Chardonnays from a range of regions, highlighting which villages will be used in which blends for 2017. To begin our journey back into 2017, we tasted some Pinot Noir vins clairs. 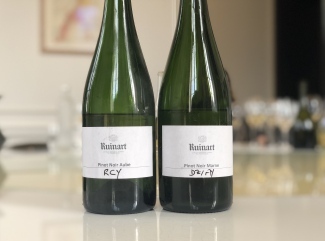 As with other houses, Ruinart had experienced some botrytis on their black grapes, particularly from vineyards in the Montagne de Reims. This can lend the wines an undesirable musty character, which renders many of them unusable. 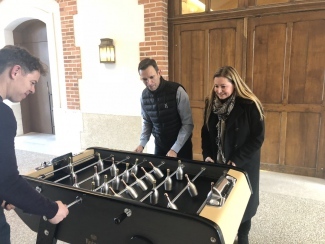 “Fortunately, the Aube was a good surprise this year,” Panaïotis said. A colour that hints of strawberry dominance. Pretty lean and acidic, some blackberry and citrus. Strong lemon sherbet notes. Great richness and texture in the mid-palate. Lots of grapefruit. “In the last 10 years, Pinot Noir has done well overall… it’s good to have a Chardonnay year for once,” said Panaïotis, introducing the white grape vins clairs. 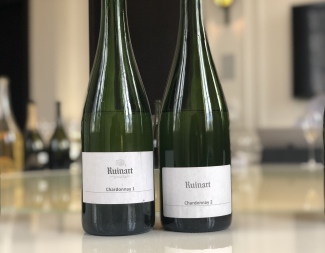 The first was from Villers-Marmery, an unusual plot in the Montagne de Reims which used to be Pinot dominant, but changed to a Chardonnay village after World War II. Surviving the hail that blighted the region in mid-August last year, Villers-Marmery features heavily in the 2017 Ruinart Blanc de Blancs NV blend. 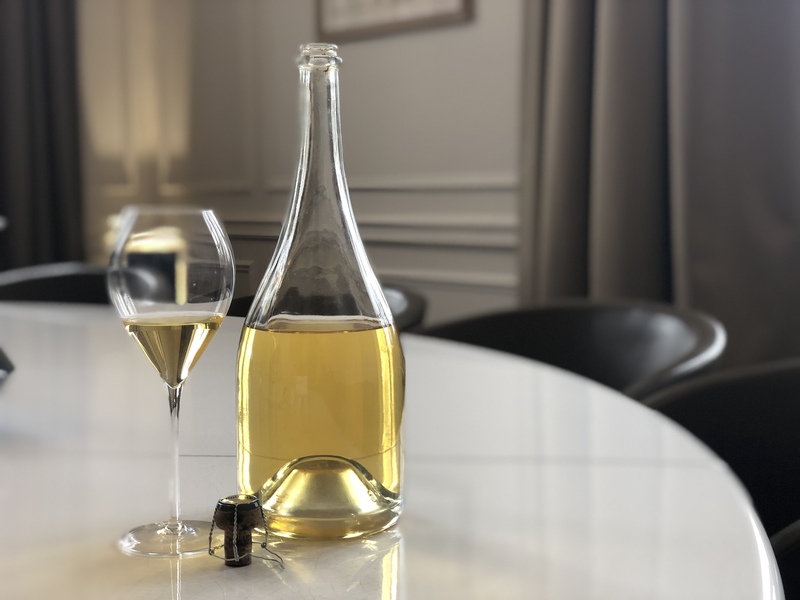 The second Chardonnays were each blends of villages from the Côte des Blancs: the first of Premier Crus and the second of Grand Crus. Where the first was quite restrained, the second had incredible power and a structure not typically seen in still wine from the region. The Grand Cru assemblage will constitute 60% of the blend for Dom Ruinart Blanc de Blancs 2017. Nice weight of fruit. Good mid-palate with lots of grapefruit, peaches, ripe lemons and some pineapple. Lots of ripe lemon, grapefruit, melon and ripe apples. Good mid-palate. Leaner than the last. Ripe lemons and grapefruit, a spicy edge and some lychees. This has structure and acidity. Lots of pineapple fruit. Nearly 30% from ’15 and ’16, so freshness from three years – a little more richness from this year. Has a lovely balance. To conclude our visit, we also tasted a range of finished champagnes. 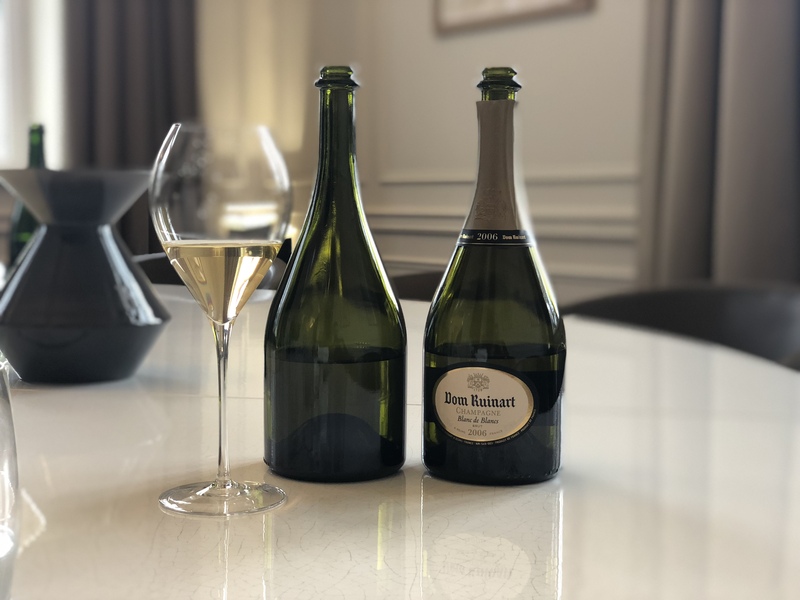 Comparing the finished Ruinart Blanc de Blancs NV with 2015 as a base year to the Blanc de Blancs 2017 still wine assemblage really showcased the strength of the 2017 Chardonnay – vibrant and generous, this will be a great base vintage for blanc de blancs. 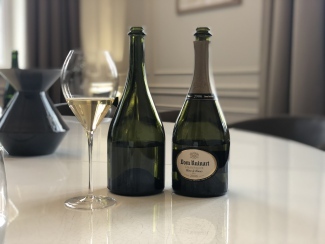 Panaïotis also shared a preview of Dom Ruinart Blanc de Blancs 2007 which will be released in September 2018. Interestingly, Ruinart are the only Moët & Hennessy brand to have produced a 2007 prestige cuvée. 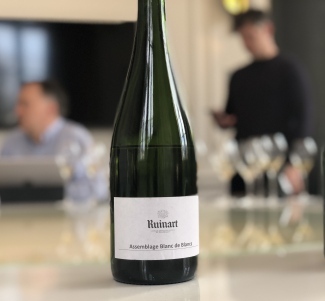 Being the first year that Panaïotis was fully in charge at Ruinart, this is understandably an important champagne to him. The blend is 75% Côte des Blancs and 25% Montagne de Reims and has a razor sharp style compared to 2006 and 2004. “It’s still a baby… needs another 6 months post-disgorgement,” he added. Our final champagne was a magnum of the illustrious Dom Ruinart L’Exclusive Blanc de Blancs NV. Crafted in celebration of the millennium and produced only in magnums, this rare cuvée has a 1993 base vintage (80%), with a selection of reserve wines (20%) from 1990, 1988, 1986 and 1985. During lees ageing, this was closed with a crown cap that had a cork lining – a popular choice of closure at the time. Although very slightly oxidative on the nose, the magnum we tasted was delightfully fresh on the palate with a sweet, candy fruit finish. Bravo!